Learn to recognize the signs of kidney disease in your cat. Chronic kidney disease in cats is a serious matter which occurs when a cat’s kidneys have deteriorated to the point where they are no longer capable of keeping the blood healthy. Normally, functioning kidneys play a crucial role in a cat’s systemic health by maintaining appropriate water and electrolyte levels, pulling waste molecules out of the bloodstream to be excreted in the urine, and generating a few key hormones. The first sign of a problem with your pet’s kidneys is likely to be a noticeable increase in thirst and a tendency to urinate more frequently and heavily. This happens because damaged kidneys are unable to properly concentrate urine. As the disease progresses, an afflicted cat will begin to lose weight, lose fur and eat more selectively. As toxins build up in the blood stream, your cat may begin to vomit occasionally, develop ulcers in the mouth, become increasingly weak and lethargic, and exude what is known as a “uremic” smell caused by excessive amounts of ammonia in the blood. Kidneys are made up of countless tiny units known as nephrons. Because there are so many nephrons per kidney, it’s not a big deal when a few are damaged. However, if a significant proportion of nephrons are destroyed, kidney function begins to deteriorate. Since symptoms don’t usually appear until two-thirds of the nephrons have ceased to work, the initial causes of the disease are difficult to determine. Kidney disease often shows up in older cats, and yet it’s not a disease that’s directly linked to the aging process. 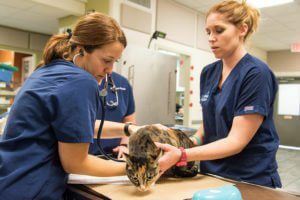 There’s no way to fully eliminate the possibility of your cat developing kidney disease, but there are some things that you can do to make this less likely. Make it easy for your cat to do #1. 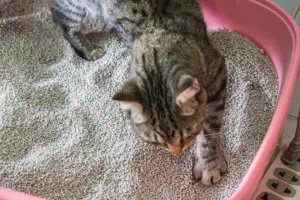 Your cat’s litter box should be located in a spot that makes your pet feel comfortable using it. Be sure to clean it on a regular basis so that your cat is not discouraged from urinating. Take your cat in for regular checkups. Routine examinations by your family veterinarian make it more likely that you will catch any signs of ill health before they develop into serious conditions, such as chronic kidney failure. Laboratory tests have become highly sophisticated and are capable of detecting minute changes in the amounts of waste products in the blood stream. It’s also important to determine the baseline levels of each test while your cat is still young and healthy. Encourage your pet to drink lots of fluids. If your cat takes in plenty of water, it’s more likely that his or her kidneys will stay healthy for years to come. Keep the water bowl filled with fresh water at all times. Serve your cat wet food. Some cats are fussy about drinking water from a bowl, but you can ensure that your cat takes in plenty of fluids by regularly feeding your cat canned food. Don’t let your pet get obese. As with humans, obesity in cats can cause diabetes, a disease with a strong tendency to lead to kidney failure. 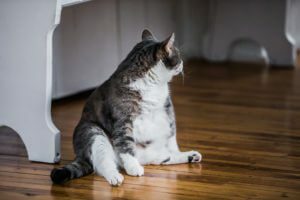 If your cat is putting on too much weight, you should consult your family veterinarian to determine your cat’s ideal weight and diet. If your cat is showing any of the signs and symptoms of kidney failure – including fur loss, weight loss, increased urination, loss of appetite and lethargy – you should schedule an appointment with your family veterinarian as soon as possible. With medications and a special diet, you can slow the progression of your cat’s disease and ensure a good quality of life. Pet 411: How Do I Help My Overweight Dog Shed Pounds?